Over 80 recent UCL graduates attended the first in a series of UCL professional networking events at ITV studios in Waterloo on 4 March, which focused on public relations, broadcasting and journalism. The events, organised by UCL Alumni Relations, have been designed to connect experienced alumni with recent graduates, and to provide information on career change, or how to break into an industry sector. Jeremy Warner (UCL History 1977), Business and City Editor, The Independent. Each panellist drew on their own career experiences to share insights and provide tips for career entry into their respective fields. David Dugun emphasised to those present that "ideas are currency" and that graduates should "always grab every little opportunity and make yourself indispensable". Annabel Dunstan and Lindsay Nicholson advised graduates to spend time finding out what they actually enjoy doing. Annabel suggested graduates gather evidence and work experience that they can present to a prospective employer. Nicholson pointed out the value of making an effort and generating tailored ideas in order to stand out when approaching employers. Jeremy Warner reiterated that graduates should have a passion for the path they pursue, regardless of specialism, and above all, that they should "be persistent". Kate White (UCL English 2006) found the event excellent: "I got some really good tips from the panel and met lots of people in the networking drinks afterwards." The next event in the series will focus on careers in engineering, covering construction, geomatic engineering and transport. It will be held in October 2009 and invitations to graduates will be sent in August. 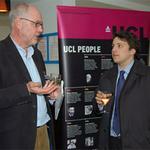 UCL Alumni Relations offers a range of events, benefits and services, communications and other activities to engage and connect graduates of all ages with UCL. As part of this offering, it has developed an alumni mentoring programme. UCL has developed a radical set of measures to support current students who are facing the prospect of graduating into an unprecedentedly difficult employment market this year.